We are now going into Spring time which offers some great fishing for all species of fish we have to chase hear in the Pacific NW. Spring Chinook Salmon, Spring Steelhead, Kokanee and Trophy size Sturgeon is just a few fish that is biting right now. Our guides have been working hard every day now that we are into the peak of Spring run. 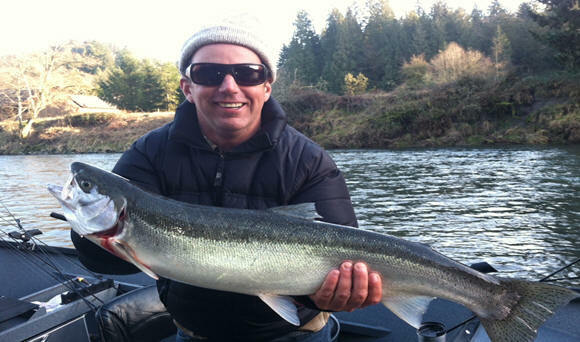 Spring Chinook fishing is at it’s peak with great catching going on in the tributaries of Oregon and Washington. There is a huge run of Salmon predicted to return this year and we are seeing the numbers right now. Each day thousands of fish are migrating up the Columbia River to their spawning grounds. The dam counts the last few days have been as high as 17,00 and as low as 7,000 per day. This Spring chinook season will continue into the first couple weeks of June. On June 15th the Columbia will reopen for a summer Chinook season that is scheduled to be open from June 15-30th. They are having a meeting today to reevaluate the run size of Spring Chinook and may reopen the Columbia River earlier than June 15th due to the big run size. We have been fishing the Willamette river in Oregon and in Washington we have focused on the Wind River and Drano lake in the Columbia river National Scenic Gorge area East of Portland Oregon 50 miles. Spring Steelhead is in full swing. I am running drift boat trips in Washington’s tributaries for these fish. This one of my favorite fish to catch and out of a drift boat is a great way to chase them on Washington’s pristine rivers. I started catching Steelhead at a young age and have continued to chase them every year. Steelhead are a tough fighting acrobatic fish that will peel line off the reel while jumping out of the water as you have this battle trying to get them to the net. There is nothing like hooking into one of these fish on light tackle. We offer traditional gear fishing and Fly fishing trips in the Spring and Summer months for Steelhead if that interest you. This season will continue through June then the summer steelhead will show up from July – September. Kokanee are on the bite and have been since early March. They are running shallow right now which is awesome not having to use any lead or just a once or two to get down to where they are at. Lately they have been with in 10 feet of the surface. This is a great trip for family or friends that want to get out on the lake and have some great action. 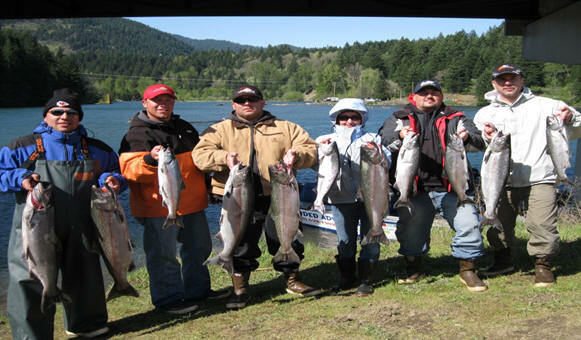 We offer ½ day and 6 hour trips for Kokanee on Lake Merwin and Yale reservoir. These are tasty fish with a big limit so you will have plenty for smoking or Frying them up for dinner. Average size is 12-15 inches. 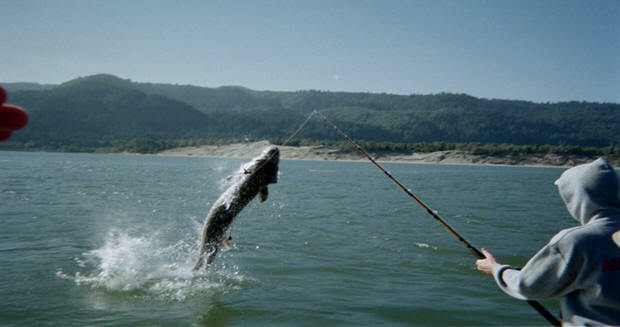 Our Sturgeon fishery in the lower Columbia River has been closed for the first time in 2014. We have a serious problem with Sea lion predation and something has to happen quickly if we are going to save this fishery. By cutting out the Sport fishing in this area is not the solution to the problem. The larger females have been decimated and we need to let the smaller fish in size grow up to be spawners. Sturgeon don’t spawn until a average size of 6 feet which makes them 25-30 years old. The sea lions were put on the endangered species list when their numbers were down to 20,000. Today there is over 100,000 Stellar sea lions and over a 1,000 of them have came to the Columbia and Willamette rivers to make a residency. Our river system cant sustain this type of mammal every day year after year. I am running oversize trips in different sections of the Columbia River if this Trophy size fish is on your bucket list. We are catch and releasing these fish from May through July on the Columbia River. Walleye are off the bite at this time due to the spawn. The river temperature is running at 54 degrees which is spawning temperature for Walleye. However I have had good days at times in May for Walleye but it is not the best time to go. This last Prespawn season was much better than last year with some nice fish being caught. The Washington state record was broke again this year with a 20.3 ponder!! That is a big Walleye and before long the World record will be caught off the Columbia. The next bite will come on next month in June and will continue into October. This could be you holding the rod!